Everybody has a dream, and for Sho Kazamatsuri, that dream is simple: he wants to be the best soccer player he can possibly be. He's the spirited leader of the Josui Junior High team and everyone looks up to him. In turn, he tries to keep the team together at any cost! Sho finds out a secret about Tatsuya's family that not even Tatsuya knows! Soon the conflict of interest turns into a conflict on the field. Matching the stormy moods on the team, the weather takes a turn for the worse, and Josui's players must overcome muddy fields and bad attitudes if they hope to achieve victory in the most important game of the district tournament! Daisuke Higuchi's manga career began in 1992 when the artist was honored with third prize in the 43rd Osamu Tezuka Award. In that same year, Higuchi debuted as creator of a romantic action story titled Itaru. In 1998, Weekly Shonen Jump began serializing Whistle! 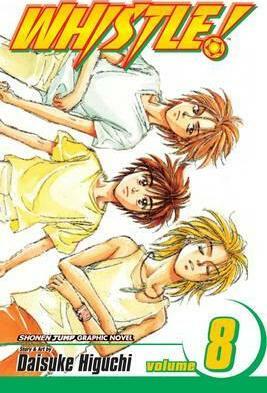 Higuchi's realistic football manga became an instant hit with readers and eventually inspired an anime series, debuting on Japanese TV in May of 2002. The artist is currently working on yet-to-be-published new series.